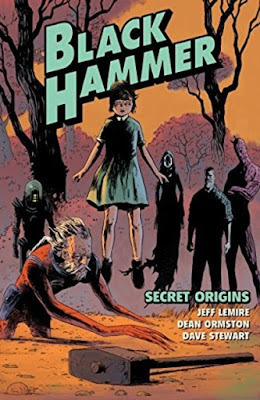 I'm always ready, willing, and able when it comes to Canadian author/illustrator Jeff Lemire. This is a twist on the usual superhero stories. This volume doesn't really have much of a plot but rather introduces us to the superhero team, their origin stories and how they got trapped in the little town they now reside in which may or may not be in our dimension. The plot revolves around the daily life the characters are now living with some bitterness and resentment. The book ends just as things get interesting, leaving us with a cliffhanger. I quite enjoyed this first volume.